Anyone who has remodeled a kitchen in the past few years knows the choices now are so varied it’s a good idea to narrow the options before you start. We found these five interesting products to get you started. One of the most eye-catching countertops in the Allied Kitchen & Bath showroom is Concetto Nebbia, a Caesarstone product handmade from fusing nature’s hues with cut semi-precious stones. The countertop can be backlit for even more dramatic effect. Allied’s floor sample uses various colors in the back lighting, which could be a conversation starter especially after guests have had a few cocktails. Price available upon request. Available at Allied Kitchen & Bath, 616 W. Oakland Park Blvd., Fort Lauderdale, 954-564-1611, alliedkitchenandbath.com. Looking for moist cakes and breads and better seared and browned meat? The answer could be Miele’s new Combi-Steam Oven, which creates an ideal environment and produces the same process that professional bread bakers use to control fermentation and temperatures for ultimate flavor. No egg wash is needed to create a golden brown crust. The combination mode allows the cook to control temperature and cooking method as well as moisture. It has more than 100 automated programs to help in preparation of meats, vegetables and grains. Suggested retail is $3,695. Available at The Kitchenworks, 1808 E. Sunrise Blvd., Fort Lauderdale, 954-764-1482, thekitchenworks.com; House of Appliances, 600 N. Congress Ave., Suite 300-B, Delray Beach, 561-278-2299, houseofappliancesinc.com. One of the main problems with even expensive dishwashers is large utensils can fall off the top rack and get stuck in the impeller, which can result in an expensive repair. 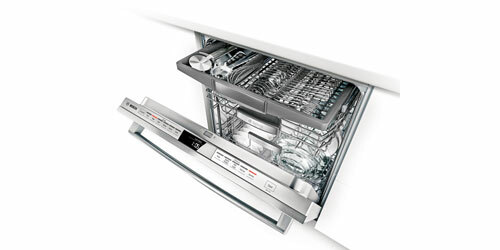 Bosch, known for its quiet dishwashers, has solved the problem with a new model designed with an adjustable third rack for whisks, tongs, cutlery and other odd utensils. It has three height adjustments and nine rack positions. A red light projects on the floor while the dishwasher is running and the unit turns off when the dishes are ready. Price upon request. Available at Coral Springs Appliance Center, 3500 Coral Ridge Drive, Coral Springs, 954-752-3880, csappliances.com. If your hands just touched raw chicken or if they are sticky, touching the kitchen faucet can be messy. Kohler has an answer with its new Sensate gooseneck faucet with Response technology. A state-of-the-art sensor responds in 20 milliseconds for on/off capability with the wave of a hand, cup or kitchen utensil. It is powered by electricity so you don’t have to crawl under the sink to replace a battery. An optional manual setting allows it to work during power outages. Suggested retail starts at $675. Available at Ferguson Bath, Kitchen & Lighting Gallery. For locations, see shop.ferguson.com. One of the biggest hassles in remodeling is removing old countertops before installing the replacement. Craig Stevens, a WSVN-Ch 7 co-anchor, found a solution with Granite Transformations, a nonporous countertop made from a combination of granite, stone and quartz. It has a ForeverSeal finish that never needs to be resealed and is more heat, stain and scratch resistant than most granite, according to the manufacturer. Prices are similar to other natural stone products. Available at Granite Transformations, 66 NE 40th St., Miami, 786-270-1722, granitetransformations.com.